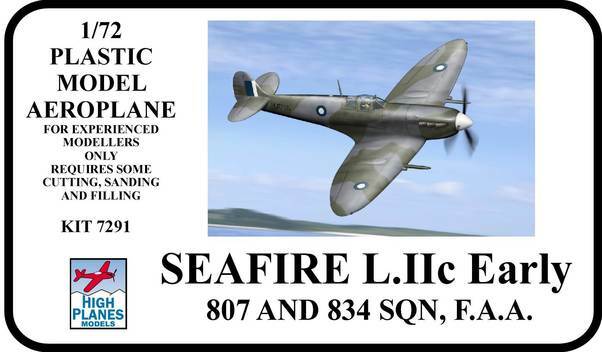 The Seafire Mk IIc was developed from the standard Spitfire Mk Vc fighter. It did however incorporate some of the changes necessary to make it suitable for Naval use, namely a fuselage that had strengthening plates fitted,arrestor hook and catapult spools. The wings still lacked wing folding, and these aircraft spent a large proportion of their lives in the open.To improve low level performance, aircraft were being fitted with Merlin 32 engines, driving 4 blade Rotol props. This enabled them to be faster than their replacements, the Mk III.. As is usual, references disagree on markings/colours, here is our best guess for these schemes.